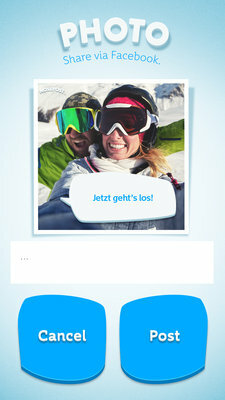 KPN introduces NosePost, the app that lets you share your favourite winter sports photos without taking off your gloves. N=5 is launching NosePost for Dutch telecom provider KPN, an app that lets you share photos without having to take off your gloves. This is because you can operate your telephone with your nose. We love to take and share photos while we are on a winter sports holiday. In theory, you just need to have your smartphone with you on the slopes in order to do this. But this can prove difficult in practice due to those thick gloves. That´s why KPN commissioned N=5 to come up with the NosePost app. 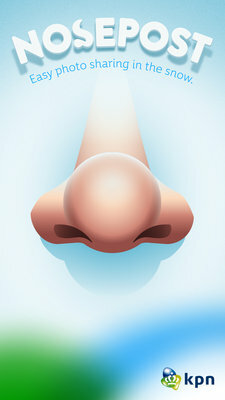 The trick with this app is that you don´t use your fingers, but your nose to take and share photos with your smartphone. Research has revealed that more than half of everyone in the Netherlands (51.7%) thinks an app like this that lets you take photos without taking off your gloves is a handy idea (source: Panelwizard). Thanks to a larger interface, you can operate the telephone with your nose. This makes it easy to take a photo and you can also add one of the pre-programmed posts to your photo. The photo will then be shared automatically. The NosePost app is part of the KPN campaign for the EU weekly bundle. This data bundle gives you an easy way to use the internet during your winter sports holiday.